If you follow my blog or Instagram, you may have caught some peeks at this little cutie – my cat Harley, a.k.a, my little beauty blogging assistant (or little troublemaker – depends how you look at it!). She loves to ‘help’ me behind the scenes, whenever I’m unboxing beauty boxes, arranging product shots, or testing out beauty items. She’s as lively as a kitten, but also entering her senior years, which is why I’ve been taking special care when it comes to picking out her kitty supplies and food, finding time to play with her to give her some exercise, and providing her with cozy, quiet places to sleep – all the little things that make her healthy and happy. Speaking of healthy and happy, when you’re living with an indoor cat, the number one essential for keeping everyone happy is fresh litter. That’s where Tidy Cats Lightweight comes in. It eliminate odors, which is especially important if you’re living in an apartment or smaller space! It’s also super lightweight which is great when you’re lugging that box up several apartment stairs! Another little essential for Harley is her favorite Friskies wet food. When she stares at me and starts making little grunting noises, I know that she knows it’s just about feeding time. She’s quite picky, too, with her flavor preferences, plus she likes to have her dry food ‘snack’ in-between meals. This could easily equate to frequent trips to the pet store, but fortunately, I’m able to re-stock on all of her Purina favorites during my weekly grocery shopping trips to Giant. Speaking of Harley’s favorite activities, another one is napping – in any little nooks and crannies she can find. That’s why this week, before all the craziness of the holidays starts, I decided to make a little hide-a-way spot for her to relax in and catch some zzz’s – somewhere she can feel safe and cozy. It’s super easy to do, only takes about 10 minutes, and uses items that most people already have lying around their house! 4. Insert your first hanger-arch into one of the holes, then push the other side into the diagonal hole. Using your pliers, bend the wire 90 degrees in towards the center on the bottom of the box to prevent it from slipping through. Repeat using the other hanger, crossing it over your first hanger. 5. Tape the bottom of the box to cover the bent wire on all four corners. (You may want to go several layers over with masking/duct tape to make sure they are secure.) Then, center the two arches at the top and tape them together. 6. Slip your t-shirt over the frame and position the neck hole to one side to serve as the front of your tent. Pull any excess fabric tight, wrap it around the bottom, then secure with tape. You’ll also need to pull the sleeves down around the bottom and secure them. 7. 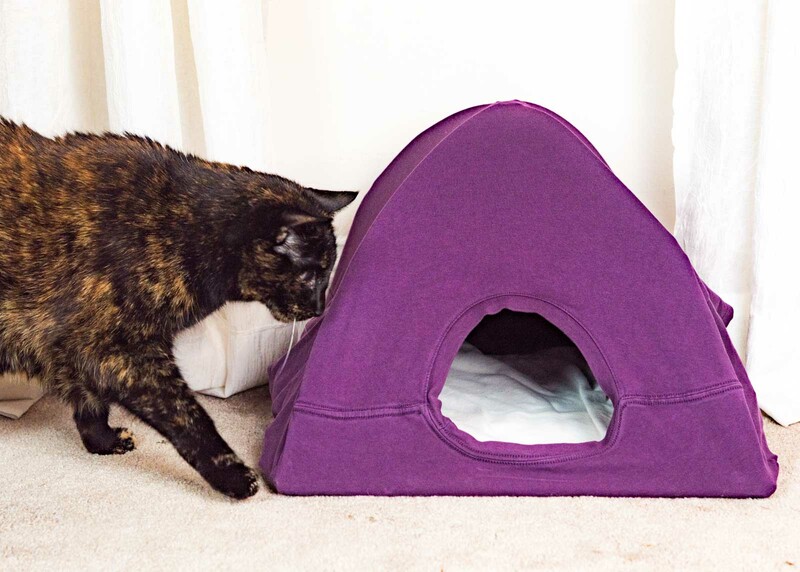 If your cat likes to lay on soft or fluffy things, you can put a towel or sheet inside to make it extra cozy. It can be so rewarding when you take time to care for and treat your cat – whether it’s keeping the litter clean and feeding them their favorite cat food, or taking the extra time to play with them, making them a cozy hide-a-way, or rewarding them treats. Each of those little activities make your cat healthy, happy, and loved, and that’s what being a pet owner is all about! If you too have a fluffy friend, make sure to stock up on litter and other kitty essentials during your next Stop & Shop or Giant Food shopping trip. You can find Tidy Cats litter and Friskies food in the pet care aisle. Coupon Bonus: SAVE $2.00 on any one (1) package of Purina® Tidy Cats® brand Cat Litter when you purchase one (1) Purina® Friskies® OR Fancy Feast® Wet Cat Food Item (good thru 12/30/16). Simply pick up your Stop & Shop/Giant Food’s Savory Magazine for this coupon in stores! What simple steps do you take to care for and treat your cat?